Your support has also inspired us to bring joy and laughter through clowning and gifts (red noses, balloon sculptures, toys and stuffed animals) to hundreds of thousands of children and parents; hospital patients and staffs ; folks in retirement and assisted living facilities, and to other community members; to members and the families of our US military branches ; and to many others throughout the United States and in seventeen countries – several of which we have visited on numerous return trips. Thank You. Support Children Surgeries We partner with other non-profits that performs free surgeries for poor children internationally. We provide both funds to support these surgeries as well as support the doctors with clowning during the screening and post care for children in the hospital. Support the Homeless and Community Our clowns donate their time at schools, retirement centers, hospitals community events and private parties bringing laughter and joy to children and their families. 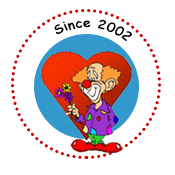 By clowning and donations we provide funds to other partners that support the homeless and low income families with food, clothing and services. Support orphanages, Scholarships, and schools Globally Through clowning events and donations we support disadvantaged children in orphanages, scholarships and schools globally. Support Children with Medical Equipment, Prosthetic’s and Clinics for the Poor Through clowning and donations we support partners that provide medical and dental equipment, wheelchairs, and prosthetic limbs and clinics to those children in-need. Disaster Relief Provide funds to our partners who help families with shelter, food, health and other services during a major disaster. To date, we have responsibly donated to other nonprofit organizations over $389,000 to help children.